A sparkling report--if that's what's wanted--on that choice anomaly, the Swiss Army: a 650,000-man militia, always battle-ready, in a country that hasn't fought a war for nearly five hundred years. "Thorn and rose, there is scarcely a scene in Switzerland that would not sell a calendar, and--valley after valley, mountain after mountain. 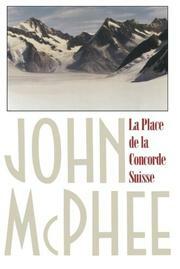 . . there is scarcely a scene in Switzerland that is not ready to erupt in fire to repel an invasive war." McPhee's chief guide, on a refresher course with the Section de Reseignements, is winemaker Luc Massy: "trim, irreverent," thoughtful. (The norm, it comes irreverently to seem.) Yet McPhee is light-fingered, ambidextrous. "Switzerland defends itself," we hear, "on what it calls the Porcupine Principle: you roll up in a ball and brandish your quills." The meticulous preparation, the assiduous practice, are as impressive as the platters of viands, the array of wines. To the strategy--"Our lines of defense are deep--one, two, three, four, five, six, seven. If all the lines are penetrated, if the enemy comes into the Alps, guerrilla warfare follows"--he juxtaposes the skepticism: Massy's and the others'. But they are nonetheless believers--even the rare rebel capitulates, becomes "a citizen who has a gun at home." (Service is for 30 years; gunownership is mandatory.) And, however willful or insubordinate they consider themselves--"in an emergency," as Massy says, "if there's a job to be done we'll do it." In today's Swiss view, disaffection balances perfectionism--but McPhee's is the version of a connoisseur, to be savored in itself.